Steve G. Jones, Ed.D., Clinical Hypnotherapist, charges $1,500 for a custom recording and $25,000 for a one-hour private hypnotherapy session at his office. But you can get all the benefits for this low price. Simply listen to the New House Stress Hypnosis MP3 every night as you go to bed for three weeks and feel the changes happening in your life. You will feel more empowered, more in touch with your true self, and you will truly know that your goals are within your reach. Steve G. Jones achieves AMAZING and LASTING results!!! Hypnosis is the easiest way to affect change in your life because the positive messages go straight to your subconscious mind effortlessly so you can accomplish your goals and reach for the stars!! All you have to do is listen to the New House Stress Hypnosis MP3 session at night as you go to sleep!!! You’ll hear soft music, the gentle sounds of the beach, and the soothing sound of Steve G. Jones’ voice all working together to bring about positive changes in your life easily and naturally. Steve G. Jones has been helping people improve their lives with hypnosis for over 17 years…now it’s time for him to help YOU… don’t wait, do it NOW !!! you’ll be glad you did. See you at the top! And as you continue relaxing deeper, deeper and more deeply relaxed, I would like you to realize how relaxed you are in every situation in your life. So that when it comes to buying a new house or building a new house you are completely relaxed. I would like you now to imagine the process of either buying building a house or both, whatever your situation may be. Imagine the entire process now, there are so many little parts of this process. But I’d like you to see all of those little parts now going into a bucket. Just imagine each of them written on a piece of paper, a small piece of paper and going into a bucket. I’d like to introduce you to a very easy way to look at the process of buying or building a house, or both and that is to take all the little parts, all the little components that make up the process, imagine them each being written on a small piece of paper and being put into a bucket and now you can look at the bucket as one process. Because there are so many steps involved, however you can choose to look at them as one step, one bucket, one step. This will allow you to be at ease, that’s right. It will allow you to relax your mind. And now I’d like you to imagine four smaller buckets near that one bucket so there are five buckets total. One bucket containing all the small pieces of paper each with one part of the process. Now I would like you to imagine those papers moving by themselves out of that large bucket and into one of the four buckets. And these four buckets will have different names, names that you choose. I would like you now to divide the entire process into four parts. Give those four buckets any labels you choose. Perhaps one is financing, perhaps one is moving. Pick four categories, choose them now and watch the little pieces of paper move out of the large bucket into the four smaller bucket into the proper categories. And now you realize that the entire process of buying a house or building a house, or both can be divided easily into four simple categories so that whenever you encounter a challenge in the process, you will imagine that challenge written on a small piece of paper and put into one of the four buckets. This allows you to relax because you will take care of all of the items in each of the buckets when the time comes. But now you are able to clear your mind by easily and instantly categorizing any challenge which arises. And when you get a chance and when you are relaxed you will go to one of the buckets of your choosing and take care of some of the items in that bucket. Some of the items have a higher priority and they are near the top of that particular bucket so you take care of that first. Some have a lower priority so they naturally drift down to the bottom of their particular bucket, but you take care of everything eventually and categorizing things in this way allows you to relax and you relax now. I would like to shift your attention now to the idea of your new house. Certainly when you decided to buy or build or both, you had a wonderful idea in mind, a wonderful, beautiful idea. I’d like to take you now to that time in your life when you had that idea. Remember the excitement of that idea, you knew that this process ultimately would be good for you and if you have a family, it’s good for you family as well. Tap into that excitement now. The excitement of having this house which you desire. Imagine the house, just imagine it, imagine walking into it. Imagine what it smells like, what it looks like, what it feels like, go ahead and touch certain things in the house even if the house doesn’t exist yet. Do this in your mind. While at the same time, you have that initial excitement that you felt when you first came up with the idea of owning this house. Walk around in the house, in your mind. In your mind, I would like you to make everything just right. The furniture is exactly where it belongs and you can change it instantly in your mind if you choose to. The colors are just right, that’s right. Imagine the neighborhood being the perfect neighborhood for you right now. You are so relaxed and happy. Imagine having friends in that house, having a wonderful time, imagine this now. See yourself there, perhaps it is a party. You invited friends over to the house. See how relaxed and happy you are and how excited you are to have this house. It is new for you. And as you now think back over the process of buying a house or building a house or both, you realize that it was actually a simple, easy process and by relaxing and taking time to categorize them in one of the four buckets, you were able to move through the process easily. Taking with you the excitement from the past and joining it with the excitement of the finished project. This allowed you to move swiftly and easily and smoothly toward your goal of owning this house and having it the way you wanted it to be. So relax now and realize that everything is going to be fine. Everything is going to fall into place. Everything is going to move along. Ultimately everything will work out. And as you take a deep breath in now, you relax deeply and as you exhale slowly, let go of any anxiety, any fear, let it go. As you breathe in deeply again, breathe in possibility and excitement. And as you exhale let go of any doubt, let it go. You realize that everything is going to be just fine. Everything is going to work out and just fall easily and naturally into place. Buying a house is one of the biggest investments and purchases you will ever make. First of all, you should congratulate yourself because it is a major milestone to accomplish in your life. You now have a house to call your own and you should feel proud to be a homeowner. There are so many different steps involved in buying a house. There is finding the right one, putting in an offer, closing, moving in, and adjusting to your new house. All these steps take time, patience, and motivation. The New House Stress Hypnosis MP3 recording will help you with each of these steps. In a stressful time, this hypnosis program will help you relax and take things on with strength and patience. If you are buying a house, the process of finding the right one can be a little bit of a challenge. You are going to have to figure out what aspects of a house are most important to you. This hypnosis recording will help you realize what you want out of a house, neighborhood, and community. It will help you visualize what you want and hypnotherapy will help you feel motivated to find the right one! If you are building a new house, then there will be times in which you will feel overwhelmed. There are many decisions to make. And often times, there are hiccups that might occur along the way. Hypnotherapy will help you relax and be calm during this stressful time. You will realize that you do not have to be stressed. Hypnosis will help you take one day at a time. If you are not building your own house, when you move in there are usually things that you will want to change. All the different projects you want to tackle around the house can become overwhelming, but this powerful hypnosis session will help you break down the projects and give you motivation to get the work done. This hypnosis session will give you the excitement that you need. You bought a house! 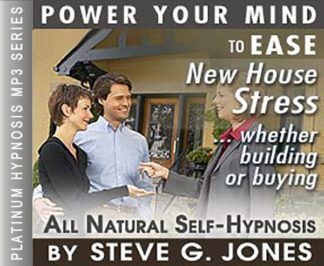 With New House Stress Hypnosis MP3 download you will learn to be relaxed and excited about your new home! Soon, you will have all the work done and you will be able to sit back and relax and enjoy your new home!